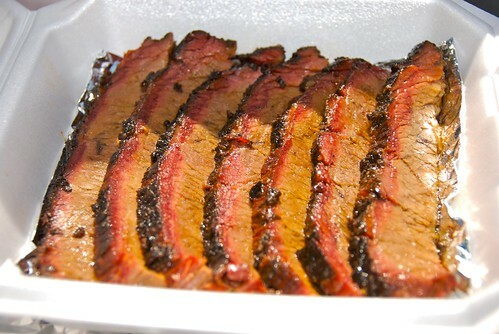 First place brisket turn-in box. I had the opportunity to participate in a BBQ competition this weekend, along with the rest of the Four Q BBQ team, up in the lovely city of Moorpark. Overall we did pretty good, 1st place brisket, 3rd place pork, 5th place ribs, and 6th place chicken. 6th place chicken isn’t bad when there are more than six teams. Unfortunately that’s all there were. We were all pretty happy with what we turned in and had a great time BBQ’n in a walnut groove. Check out my photos from the event: See my flickr photos. Want to see more? Then check out Soul Fusion Kitchen‘s flickr photos here. Looks great! What kind of contest? Whose sanctioned? Also..weldone its nice to win things. Congrats. When are you going to review more BBQ joints in LA? The last one that I saw was last year. When it comes to winning at whatâ€™s most important at a BBQ, I think all of you had the joy of winning first place in all categories. The most important part of being at a BBQ, is having fun.